Conversations are a great way to breathe life into characters and advance a storyline. Below is a summary of the Conversations editor. In the Tenterhook world, a conversation is a collection of branches and leaves. 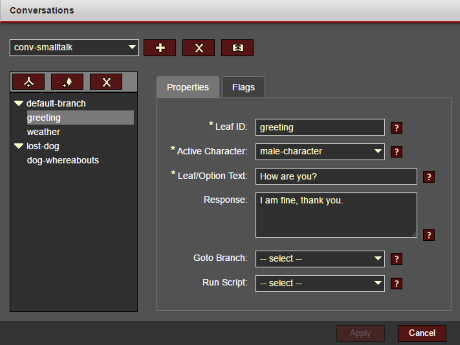 Branches are collections of conversation options (the "leaves") that are available for selection. An option/leaf is a question or comment that the active character can speak. When a conversation starts between two characters, default-branch is always the starting point. Depending on the option ("leaf") that is selected by the player, the conversation may progress to other branches. You'll notice in the screenshot above that a leaf comes with many options. When the player selects a particular leaf you can execute a script, set or clear flags, jump to another branch, and/or display a default response. You can even control the visibility of a leaf based on who the active character is and/or which flags the active character has. Executing a scenario that combines the Talk to command and a specific target. Triggering a script which contains a ToggleConversation action.